CHELSEA space is pleased to announce Ken Cox: Poetry Machines as the second exhibition in our spring programme. 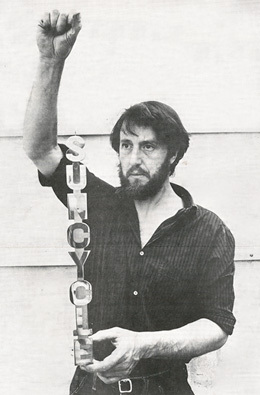 A highly influential sculptor of the British concrete poetry movement, Kenelm (Ken) Cox (1927-1968) was a creator of kinetically powered poetry machines that made words move in space as material objects. In many of his works letters do not correspond to semiotic language, but instead show a curiously textual approach to sculpture, in which words are not so much read as felt. Cox’s career was cut tragically short in 1968, not long after the opening of his first solo exhibition at the Lisson Gallery, London. This is the first time his works have been shown in London since then, re-asserting Cox as a significant figure in the concrete poetry movement. Ken Cox: Poetry Machines has been curated by the concrete poetry specialist William Allen and CHELSEA space, with assistance from the Cox Estate.